All 33 users of this procedure reported either successfully removing their wart or definite progress in doing so. In many cases they used this procedure as a last resort after finding other treatments only made their warts bigger. Unfortunately this apple cider vinegar wart treatment can be painful as 63% of the users reported. Using over the counter pain medication was found to be helpful. If after that you still find the procedure is too painfull, you can check out Charles Davidson's all natural pain-free treatment written up in his e-book here. I have had a wart under my right hand index fingernail for the better part of 5 months.I tried everything from freezing it, to burning it, to over counter remedies and nothing worked. I found this website and thought I would give it a try. The first night I tried the acv remedy it hurt pretty bad. My finger was throbbing with pain. 2 days later my fingertip is black and brown, and starting to scap. I must say it looks pretty bad, but it feels a lot better. Hopefully it wont be long before its gone. I posted a comment back in late December that I was just beginning to try this and here I am In Mid March and it is completely gone. There is no evidence the wart was even there!! So happy that I spent 3 bucks on the apple cider vinegar instead of a $150 dermatologist visit. I had about 4 warts on my hand that started out small and started getting bigger. I went to the doctor twice to get them burned off and ended up spending $300 because it is considered a surgical procedure. Well, after all of the pain and money they just came back even bigger. I was searching the web and saw about ACV. IT WORKS!!!! I'm telling you its amazing, I doubted it, but I'm telling you, as long as you stick with it every night it will work. The warts on my hands were big, not just little ones, they were huge. If you have warts, please do this, I can now live my life without constantly worring that someone is going to see them. Having read the back ground to using ACV on the web I have just bought a bottle to treat a wart on the side of my nose. It has formed at the point were my glasses rest on my nose so it is in an awkward place. Fingers crossed the ACV treatment will start to work. I have had warts on my fingers for about 10 years. I had about 30 or so on one hand alone. Several of the little ones are completely gone. My biggest one is well on its way to being gone. It turned black two days ago, so I picked at it. Now I have a dent in my finger but it is healing. Yes some days it was very painful but its worth it to me. All I have to say is please don't give up. They will go away with this treatment. I have warts on my neck, I went to doctor and had them freezed with liquid nitrogen, after a few weeks, they appear again, some in the same spot, some in the new spot. I have been using the ACV for 2 days, the warts become swelling and white, but the surrounded skin seems black (like burnt wound). The warts are close to each other so I used a big cotton to cover the whole area, the result is the surrounded skin which was not infected become red/black and hurt. I hope the warts will be gone soon and my neck skin will regrow to the normal condition, although I know is hard to avoid the scar mark. This site has given me hope, so I believe that it is my duty to spread the word! I got my first stubborn plantar wart a few years ago. After various failed treatments (super strength salicylic acid, straight duct tape, sulfur, garlic, thuja) and MUCH grief, I got rid of it via a homeopathic remedy. Now, 3 years later, and to my horror, the thing returned (to a different site on my foot). So I went back to the same homeopathic practitioner for treatment. Alas, 6 months down the line (and several hundred dollars poorer), no change in the wart, except that it was getting bigger from effluxion of time! Action needed to be taken. I first read about ACV online, and though somewhat skeptical, bought myself a bottle of ACV ($2 - cheap! Especially compared to the monthly $100 visits to the homeopath!!) and began treatment. I would apply a Q-tip soaked in ACV 2x a day, covered over by duct tape. At first the wart pushed out of the skin and was all white and puffy (about 8mm in diameter - gross). It would hurt when I stepped on it (but only stung a little bit when no pressure was applied). After about the 4th day, bits of wart started flaking off and there was no longer any more pain. My wart never turned brown/black (unlike other testimonials) - bits of it would just flake off. It's been 7 days now, and the only thing that is left are 3 small black dots (exposed after another chunk of wart came off today) - I suspect it won't take much longer for my foot to be wart free! Am extremely amazed AND delighted with the results. Whoever discovered this was genius. 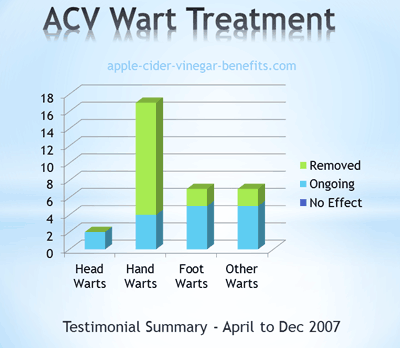 I first started ACV treatment in August when I was at my wits end with a wart on my finger and my toe. This treatment is effective and I would recommend it to anyone. The wart on my hand turned brown, never black, they also turned hard and crusty. I picked off the wart on my finger little by little until it had completely gone. It took about 2 weeks to be rid of it totally. The wart on my toe is a different story. This wart responded straight away to the treatment and was very painful. This too became brown, then turned black and I was able to pull it off in one go. That left a really tender area which I didnt treat further. I think this was a big mistake because it never healed properly- the skin looked new and wart free but it felt hard like a scar and was always a bit redder than the surrounding skin. About a month later the wart was back. I'm onto my 4th day of repeated treatment and the wart has gone black. I'm going to let it scab over and try not to pick at it too early. Last night was my first time trying the acv treatment and I woke up with my thumb THROBBING! I was a little freaked out seeing the wart was now swollen and white this morning. (Apparently this means its "working" from your comments.) I'm using two band-aids and re-soaking the cotton every few hours. I'm going to wear it 24/7 until it's gone! (Sorry work-mates) But this is ALL OUT WAR! I've tried EVERYTHING otc and had it frozen off twice. All that treatment did was make it come back bigger! I was about to give-up (and name it Wally) but now I have hope with the acv! Thanks for the comments and I'll follow-up soon! Wish me luck! I started the treatment only three days ago. Tonight I was able to rub the top of the wart off, sticky fluid came out of it. I just have a dent left on my finger. I put a bandaid with Neopsporin on it and went to work! This is absolutely amazing! I hope I am rid of it completely! I had literally at least 20 to 30 warts on both of my hands for at least 3 years, I tried all of the over-the-counter stuff and nothing worked. I even went to the doctor to have some burned off, which left many visible scars. I tried the ACV method and in less than a week they are all gone, I can't believe it! These have been such an embarrasement for me for such a long time. Who knew that something so easy and so cheap could work so well. I am so glad I stumbled upon this! Thanks everyone! I got serveral small warts on my fingers/cuticles after picking them up at a nail salon. After trying the drug store methods and asking a western MD about treatments and finding out that they can be frozen off, but often need multiple treatments I turned the internet! I can tell you that this is, hands down, the cheapest and most effective treatment for warts I know of. I cut of the end of a q-tip, soak it in ACV, and secure it to the wart with a bandaid over night and then I just leave them open during the day. It hurts, but it's SO worth it and the pain is temporary. Anyway, after a few days (usually 2 or 3) when I know it dead at the root, I cut them out and then let the "hole" heal itself! I had a wart on my arm that was frozen off about 3 years ago. It eventually came back. I started using ACV with cotton and bandaids 4 days ago. So far it seems to be working. First it turned puffy and white then it got little orangish brown spots on it that I rubbed right off. The wart is definitely smaller and almost gone so I reapplied the acv today. It didn't really hurt much at all. I would strongly recommend this treatment. The pain is exquisite but progress is being made. I started about 5 days ago with serious and dedicated effort to remove some plantars warts that have been on my foot for over a year. I scrape with a pumice stone for about a minute then soak my foot in a dish of ACV for anywhere from 10 to 40 minutes. The past few days have been a study in pain tollerance but there seems to be real changes going on under my foot. Four blackish indent/holes are clearly visible and the skin around them is white and raised. (one started to bleed ever so slightly this evening). I have no idea how long this process will last but I'm going to stick with it until the pain subsides and presumably, the warts are gone. i'll follow up with my final results. I started this treatment 2 days ago and, so far, it seems to be working! I have had some genital warts from HPV for about a year and 1/2. I was first given Aldara cream for 4 weeks (3 times a week) and nothing happened cuz it was definitely not long enough. A couple months later my gyno gave me another prescription of the Aldara cream to use for 4 months. At the end of the 4 months, they were all still there, 1 turned completely black and fell off in my hand (gross haha), the others became somewhat crusty since the skin had been dying. I was at the WITS END, spending SO much money on Gyno visits and the Aldara cream. My doctor told me a couple weeks ago he would need to surgically remove them in the operating room. I basically said "screw that!" and I have come to my last result. I tried the Apple Cider Vinegar which cost me under $2 just a couple days ago, dipping a cotton ball or piece of paper towel in the ACV and putting bandaid over it throughout the night. I woke up with my biggest wart to be white, puffy, extremely sensitive and painful. (the pain went away in about an hour). Later that afternoon half of the wart had turned black. I have tears of joy using this treatment, and it only angers me that my doctor saw me sitting in his office in tears for over a year now, my boyfriend not being able to touch me, and hating my body... and he never said ANYTHING about the apple cider vinegar! The warts are not gone YET, but i'm very optomistic about it, and happy this works so fast! Trust me when I say that this method works!! I had a wart on my knee that wouldn't go away, I read about apple cider vinegar and gave it a shot. Whatever you do...don't get discouraged by the pain or by it 'getting bigger' at first!! Stick with it, because it's all part of the process. It swells up first, and then eventually turns black, and falls off. I kept the vinegar on it 24/7, and the wart was gone by the end of the week. Thank God for this treatment!! I wish to encourage all to use ACV. I had a very distinctive embarrassing wart on my thumb for over a year which was getting increasingly bigger with different treatments I had been using. I had spent a small fortune on all types of treatments and was becoming used to the fact this sucker was with me for good! On reading articles on the internet I decided as a last resort to try this method. It cost me 69 pence for the vinegar, plasters and cotton buds I already had. I applied it to my wart before going to bed, and yes the pain was so bad through the night it woke me and I had to remove the plaster. The following morning my thumb was nearly twice the size, throbbing and very painful, throughout the course of the day it started to turn brownish. That evening before I went to bed I could hardly bring myself to apply another application but this was my last hope and I applied it anyway. During the course of the night the pain wasn't as bad as the previous night and I again had to remove the plaster. On inspection after the second application the wart was black and still throbbing and very painful. I persisted for 10 days, as time goes by the pain does get easier. I am completely wart free now, I do have a healing dent in my thumb but hey no wart! Please persist and be rid of that wart. I applied the ACV and left in on for the whole night the next morning it was a greenish blackish color. Later that day I picked at the wart and the whole thing fell off. So now skin just has to grow back over where the wart was and I should be all healed. Has anyone else picked their wart off or has everyone's just fell off??? I have had trouble with warts for years now, and they would usually clear up on their own after a few years or so, but my wedding is coming up soon and I want to be wart free. So after trying all the usual methods of removing a wart, otc freezing kits, salicylic acid, etc. I found out that Apple Cider Vinegar could get rid of them. The warts have become swollen, turned a brown-ish colour and I can see black spots in them. I am on day 3 of the treatment and one of the warts is completely black (and throbbing) and the other is beginning to react with black dots forming at the center. I am encouraged by the comments posted here and I hope that the warts will fall off soon. I tried everything from home-freezing kits, duck tape to get rid of them. I was just about to pay for private treatment, that would have cost a fortune, when I read about using Apple-Cider vinegar. However, if anyone out there can give me some advice on the application of the ACV, I would really appreciate it. I'm soaking the warts for around half an hour in ACV with a little hot water each day and then taping them up during the day with some neat ACV over the wart and again at night. The problem I'm having is getting the plaster (band-aid!) to stick when there's moisture from the cotton ball underneath it. I'm having to put the cotton wool over the wart, put the plaster over it and then taping all of that together! It's alot of tape and I'm worried the cotton is slipping. I'll write again in a few days time and give an update! I used the ACV treatment and it worked for a wart on my thumb. As the web-site said it turned black and fell off. Yes it did hurt a little but nothing you cannot handle! However in less than a week it has come back so I am trying it again. Hopefully it will work this time around. Any others had this problem? Ok. Let me start by telling you that I had warts around four of the nail beds on my fingers. Everything that I read online about these types of warts (I think they're called periungual warts) said that they were very hard to get rid of. I even read a couple of articles saying that they could turn into squamous cell carcinoma!! I started the vinegar treatment on a Sunday during the day for about 3 hours. I pulled off a little piece of cotton, soaked it in the apple cider vinegar, squeezed it out and kept it in place around my fingers with band aids. The first day wasn't bad (no pain). On Monday I did the same thing, it burned! I kept it on for three hours during the day on Monday and then did it again for three hours in the early evening. There was no way I was going to attempt to try this overnight since the burning was pretty bad. I did it again on Tuesday for three hours during the day. The warts at this point were puffy and turning black. By Thursday, the pain had all but subsided and the warts were getting scabby. Long story short, it's been 10 days and the warts are gone!!! I’m still in shock at how great this worked. And don't let the pain stop you. It's only temporary and it's totally worth it! I've been fighting a wart for a year now on my index finger and NOTHING was working! I tried regular salicylic acid that you apply yourself, otc freezing, medicated bandaids, even banana peels! At my wits end, I started the ACV method last night. It smells bad and hurts like the dickens (it actually hurt so bad it interferred with my sleep), but amazingly it's done more than anything else has! When I removed the band-aid today, it was puffy, swollen, white and painful, but had a little crater in the center. By late afternoon, it was shriveled up and black! I'm still working on this method, but reading the comments on this site and seeing the progress has given me hope! I'm crossing my fingers! Wish me luck! I have used many treatments to treat my wart on my toe (the toe next to my pinky toe on the left foot), doctors cut it out twice, which actually spread it, and I've tried the freezing for months. I used otc things as well. Nothing worked! Since my wart expanded in size from the doc cutting at it, I can not seem to get rid of it. I've been using ACV since April off and on. I will use it for 2 weeks straight and usually the wart falls out, and it looks like new skin. However, a week later the wart seems to come back. What's up with that? Has anyone else ever had this same problem. The reason why I haven't stopped using ACV is because it seems to be working. It turns black, raises out of the skin, and falls out. It is quite painful too with hard throbbing and aching, just like a knife almost stabbing you. I usually soak the cotton ball and keep the wart suffocated 24/7 with a bandaid wrapped around it. Has anyone suffered through the same problem with it comingback after using acv? If so, please don't hesitate to contact me Poopster0118@yahoo.com. I would really apprecaite it. Thanks! I rolled my eyes when I first read about the Apple Cider Vinegar for warts. However, I tried it because I was at my wits end with both a wart on my hand and a plantar on my foot. It has been 2 days and it's working. The one on my hand is brown in the middle and the skin around it is white. The plantar is raising out of the skin a bit. I'll update more in a couple of days! WOW! I had a plantar wart on the sole of my foot and did a combination of soaking my foot in hot water vinegar solution for 15 minutes each night to soften up my skin, then I would treat with straight acv and a bandaid. It hurt, but within two weeks it was gone! This is after having tried freeze off as well as wart pads for a couple of unsuccesful months. I have also removed a plantar wart from my son's foot with the same methods. I am beginning to think it works because the acid kills the virus in the wart itself and that because it also soaks into the surrounding skin, it kills any wart virus there also that might try to reinfect. We had taken our 4 year old granddaughter several times to the doctor for treatment of warts on most of her fingers. Nothing seemed to get the warts to heal. We tried all of the drug store treatments. And then we read about the vinegar treatment and followed it. Our granddaughter now is wart free after only 3 days of treatment. With no scars. I am on my third day of the ACV wart treatment and the area around the wart is very swollen with a white ring around it. Day 2 was the worst pain but paracetemaol tabs helped dull the pain a bit. The pain is like a skewer being driven into my bone! I have also been soaking the finger my wart is on in ACV for 20mins once a day so I'm hoping this will speed up the process. I am so sick of this wart that I cannot wait for the day it comes off! I have tried all the usual wart treatments to no avail but I think the key to treatment is persistence and patience. ?I have been doing this treatment for 6 days and the wart on my index finger is now GONE! Of course there was pain and eventually the wart got really soggy and I just picked at it a bit which wasn't painful and it came away. Thank you to this site for letting everyone know about Apple Cider Vinegar. I started using this treatment 3 days ago. Have tried every treatment under the sun to get rid of a wart on my index finger. The wart always seems to come back bigger and stronger. So far I am seeing a definate reaction...it's turning black, with a raised white ring around it. This treatment is definately not painless, but I have found a couple over the counter pain relievers help. Today the pain is much less. I will keep up the treatment and keep you posted!! Here's my update...Since posting on June 3rd. My wart is GONE! The use of ACV is painful, but stick with it!! The pain only lasts for a few days (compared to years of having the wart) and over the counter pain relievers do help. GOOD LUCK TO ALL!! I recently used this treatment and told a friend about it...he had a wart on his hand also and had been using the duct tape treatment forever, (without much success). He tried the ACV and within a few days his wart was gone too! I've had a plantar wart in the middle of my foot for years and have tried every removal method to no avail. Started the ACV at night 6 days ago, and also during the day taped to the bottom of my foot, and it began to turn black and now it's blackish-brown. it has a strong white raised ring around it and it hurts all the time - stings like a scab being slowly removed - the skin around the white ring looks like new pink skin. Apple cider vinegar is a miracle worker when it comes to warts. I had a small wart on my thumb and it fell right off amazingly. I had tried the freeze packs you can buy and the bandaids with the medication on them and nothing worked. This made it literally fall right off after a week! My husband had a much bigger wart on his palm. It was horrible, he tried lazer treatments which hurt him so much, and having it froze off by a doctor. Nothing worked! It just kept growing! So after I used the vinegar on my wart I told him to just try it and see what happened. It only took 2 weeks and it fell off! You can't even tell he ever had a wart! Absolutely amazing and we feel like such fools wasting so much money in buying all the over the counter treatments and for him getting those procedures. You have to try it. We keep apple cider vinegar in the house at all times now. And it was only 79 cents! I had a wart on the end of my index finger for 10 years. It always bled and cracked, and was lumpy. I used ACV on a q-tip cotton ball --(remove cotton from q-tip) and dip in ACV and put a bandaid over it each night. It throbbed a lot for 4 nights, but then came off within a week. It turned black and now it is totally gone!! Skin very smooth, and looks like it did 10 years ago. It works!!! I have had a wart on my index finger by the nail bed for almost 11 years now. I have tried everything from OTC solutions, duck tape, Dr. Freezing it many times to tagament. Nothing has worked. I have been trying the ACV for 3 days now and it seems to be working. It has turned black with a white ring around it. The only draw back is that it hurts very bad and I have had trouble sleeping. I am willing to put up with that to finally be rid of this.